I just might have said that out loud, with a grand Vanna White flourish as I placed a platter of these on the table. And then I might have made a trumpet with my hands and made an embarrassing trumpet-like Du du-duh-daaaaa to call all and sundry in my kingdom to feast. God I am embarrassing! How do they ever allow me out in public? 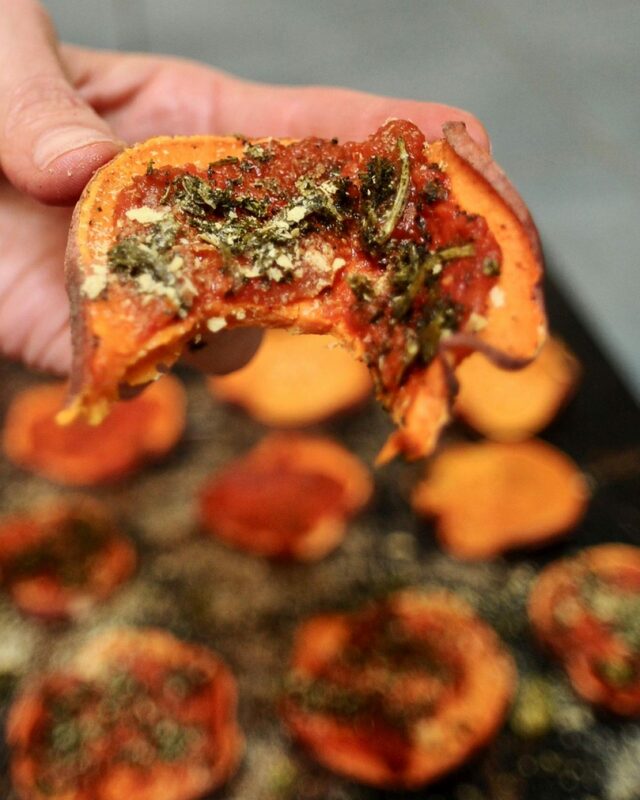 I was going to call these Vegan Sweet Potato Pesto Pizza Bites which runs as trippingly of the tongue as Vitameatavegamin. Remember that I love Lucy episode where she hawks “vitamin water” that contains alcohol and is increasingly more tipsy through take after take? In the past four months about four contractors have shown us the veracity of this old joke. 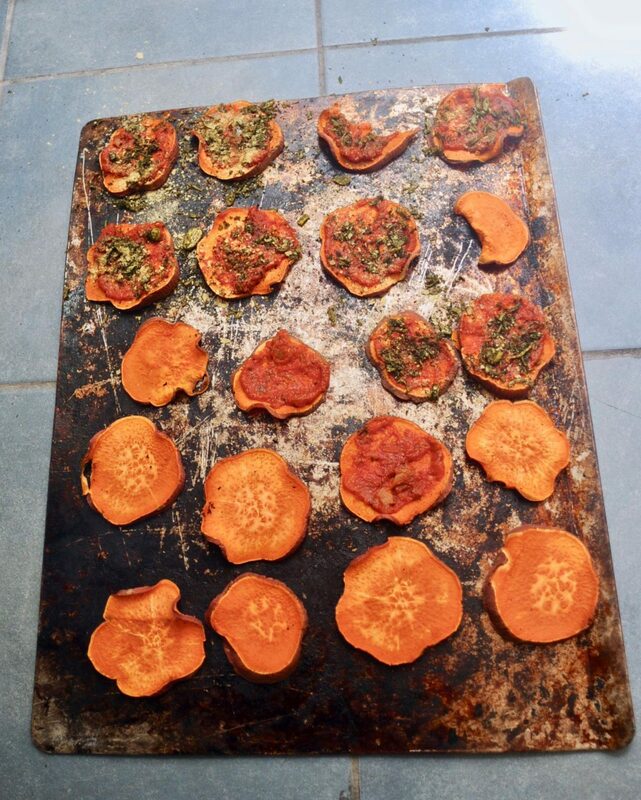 Between guests at our Airbnb I snagged my mom’s toaster oven and made up a batch of these Sweet Potato Pizza Bites. 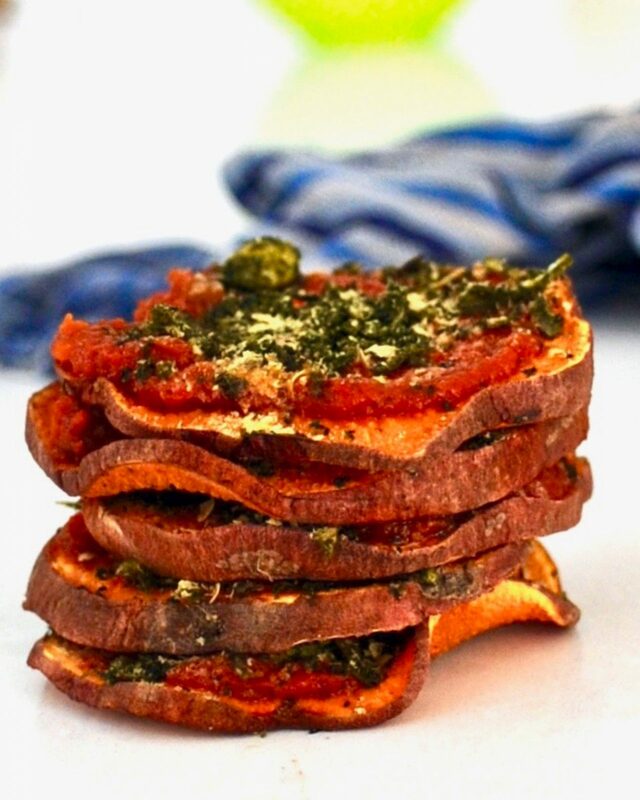 I wanted a fast, delicious, healthy, and gluten free snack to serve to guests in the garden. A 20 minute healthy after school snack. I even like them cold from the fridge. Feel free to add meltable vegan cheese before the final bake. Although I am perfectly happy with the cheesiness of nutritional yeast. Heat your oven or toaster oven to 400 Fahrenheit. 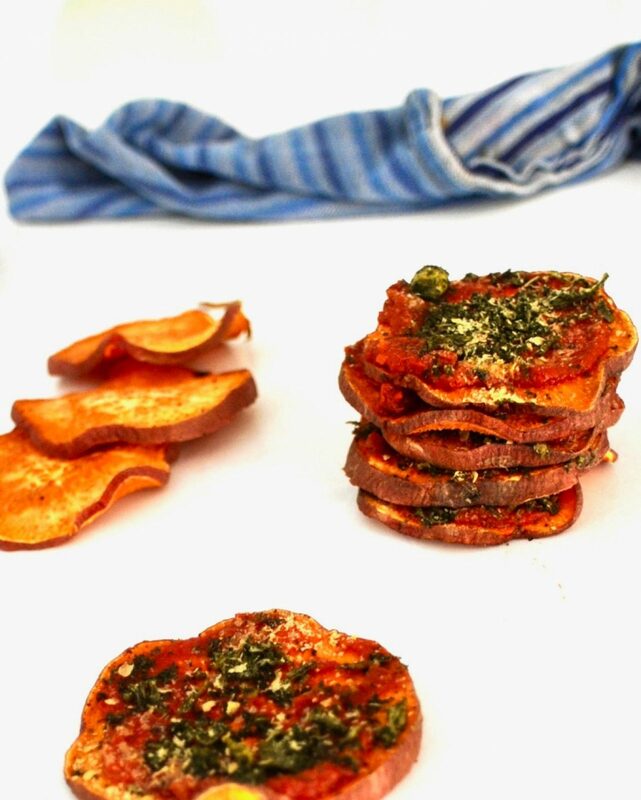 Slice your sweet potatoes thinly to just under a half inch thick. I cut my into small rounds cause they are cuter that way but cut them the long way if that floats your boat. Arrange them in a single layer on a baking sheet. Bake for ten minutes. Flip them and bake another ten minutes. 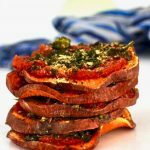 Now smear the tops of each with a smear of marinara and then top with a smear of pesto and a sprinkle of nutritional yeast. Bake another 5 minutes until slightly tender but retaining the structural integrity to hold together and be eaten like a slice of pizza. Mmmm! Can’t get enough sweet potatoes. Yesterday I made your Butterfinger Breakfast Bars ( http://www.sunnysidehanne.com/butterfinger-breakfast-bar/ ). I’m going to feel good putting these into your niece’s lunch box, or – when we get up too late to have a warm breakfast – shoving one into her hand to chow down during her dash to school.